The San Donato dairy is situated in Castellucchio, within the province of Mantua and specifically in the area of permanent meadows. Today we are fortunate enough to meet its president Giorgio Cecchin, its deputy-president Giovanni and Alessandro, a member of the board. The dairy has 9 members, all located within a few kilometres of each other. The dairy acts as a meeting place for them because the cooperative board convenes at least once a week to discuss financial performance, product quality, and the options for investing to secure continuous improvement of the business. The autumn marks the last mowing of the meadows and the harvesting season for maize and soya. In addition to working in the fields, the members are constantly busy tending the cows that produce the precious milk. If the cows are well they will produce good milk. Giorgio, the President, reminds everyone that making choice wheels that taste good is the sum of everyone’s work. There is not a single step that is less important than any of the others. 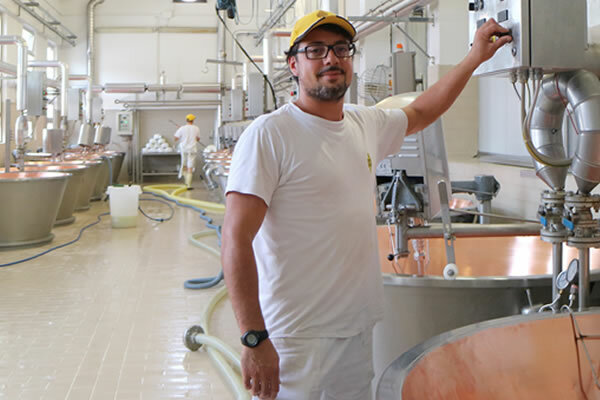 Grana Padano production is entrusted to Fabio, the current cheesemaker whose young age surprises us: he is 35 years old and has been the cheesemaker for two years, but has been working at the dairy since 2006. His father worked right here at the San Donato dairy, where the whole family lived. 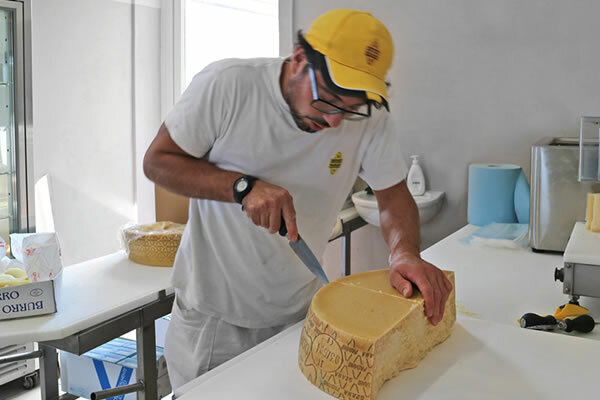 We ask Fabio when he made his first cheese wheel, but he doesn’t remember because ever since he was little, he would watch his father making cheese, eager to discover the secret for making Grana Padano. Today he actually cut open his first wheel... he had been waiting for 24 months and today he was delighted to find that his cheese is really good! In addition to Grana Padano, Fabio makes Caciotte and Ricotta, which he sells at the dairy shop where Tosello is also in high demand. 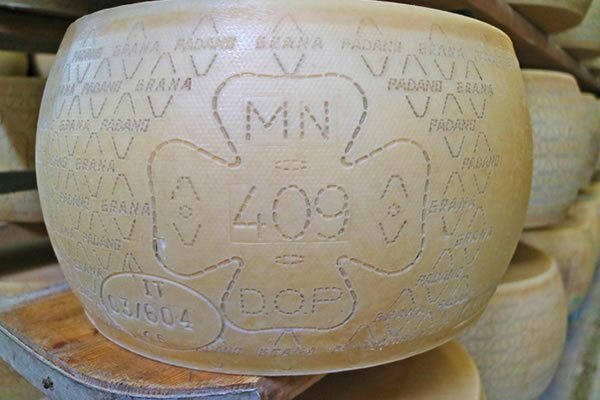 These are offcuts from the fresh Grana Padano wheels made in the morning. Giorgio Cecchin, who is showing us around the dairy, tells us that Tosello is very popular among women! This may be due to its very stretchy texture, or perhaps because it tastes of milk, cream and yoghurt. Fabio also runs the dairy shop, which is open every morning, every day... including Sundays! Once cheese production is over inside the plant, Fabio moves over to the shop, which for the past 60 years has also been the place for a chat with customers and friends. While we are in the shop, two ladies come in to stock up on Grana Padano, for themselves and for their children. They have always bought it from the shop and it’s always on their table at every meal.